Is it okay if twins co sleep? This is a common question from parents of newborn twins. Can their babies sleep together in the same crib, cot or bassinet? You will actually find that a good number of hospital nurseries will indeed put twins together in the same bassinet and even incubator at times for sleeping. 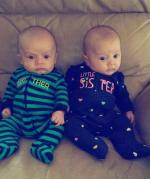 Being together in the womb for so many months it seems natural that twins should remain in close proximity. When they are allowed to sleep next to one another they typically exhibit more relaxed, calm behavior. They also tend to do better at feedings and even show stronger vital signs. Be sure to talk with your doctor about the hospital's policy on this. We have found that most hospitals will encourage twins sleeping together, however we have heard of a few cases where it was not allowed. If this is an important factor for you then definitely get answers before labor and delivery. There may be a chance you can deliver at a different hospital or make other arrangements that will suit your needs and wishes. 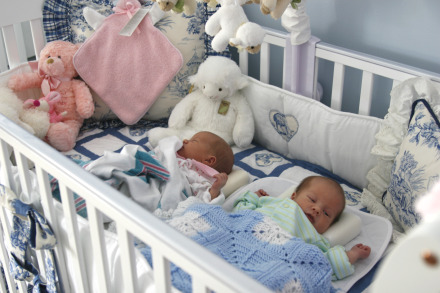 Numerous parents will continue the co-sleep arrangement for their twins when they bring them home. If your babies have a stay in the NICU they will likely be on a decent sleep schedule (NICU nurses tend to be very good at this!). In the end, it's basically a personal decision, but here are some things you should consider. What kind of set up will you have? Twins can only sleep together in the same bassinet while they are still very small. They can sleep in the same crib, but only until around six months or until they start rolling over. You should have the extra bassinet or crib available in the event that it does not work out or other issues arise (i.e., one twin wakes the other up or gets sick). You may even decide on a "twin specific" crib , one that will accommodate both babies with a barrier or railing in the center. A lot of your decision will ride on how your particular twins behave in a co-sleeping environment. Some do very well, but a few may have issues with waking the other twin. 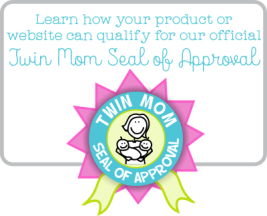 Be flexible as you find what works best for your twins. 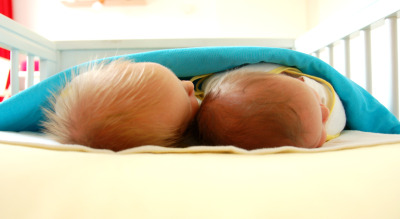 Although the American Academy of Pediatrics does not support co-sleeping of infants with siblings or adults (due to SIDS), they do not specifically refer to twins in regard to this matter. Always consult a qualified health care professional with any co-sleeping questions and concerns, as this article is not intended as professional advice. There have actually been some studies done on this specific topic. Here's an interesting article about a twins co-sleep study that's worth the read. Grab your Instant Baby Sleep Soundtrack now! *Please Note: The images provided here are just some examples of what other parents have done. 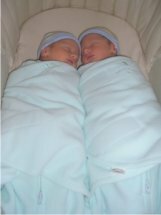 Many parents only have twins co-sleep during nap times when they can closely keep an eye on them, and hence, are comfortable with using the same blanket or having other items close by. In any case, the images are just examples and not endorsed as either the right or wrong way for twins to co-sleep. You, of course, will ultimately have to do what works best for you and your babies after talking with your pediatrician or other healthcare professional. Home › The First Year › Twin Sleep Schedules › Should Twins Co Sleep?